Hummus with a Mexican twist - it's really just an excuse to eat hummus as a meal. Adding Pomegranate seeds adds a refreshing burst to cut through the spice and mellow out with the coriander. Step 1 Start by rinsing your chickpeas and get all the gross syrupy water out of there. Step 2 Blend chickpeas, chipotle chili (and some abodo sauce), tahini, lemon juice, ground cumin, water, garlic cloves, olive oil, salt. Step 4 For the spiced cauliflower we want to start by dry roasting our whole spices of cumin seeds, coriander seeds, black peppercorns in a frypan on medium heat for about 30 seconds or until fragrant. Step 5 Crush up the spices in a mortar and pestle and mix in the smoked paprika. Set aside. Step 6 Cut up your cauliflower in to small florets. Add 2 tablespoons of olive oil to a frypan on medium-high heat. Wait until oil is hot and add your cauliflower in batches. Turn occasionally and cook for about 5 - 10 minutes until golden brown. Step 7 When your cauliflower is cooked, move to a bowl and toss to coat with the spice mixture. 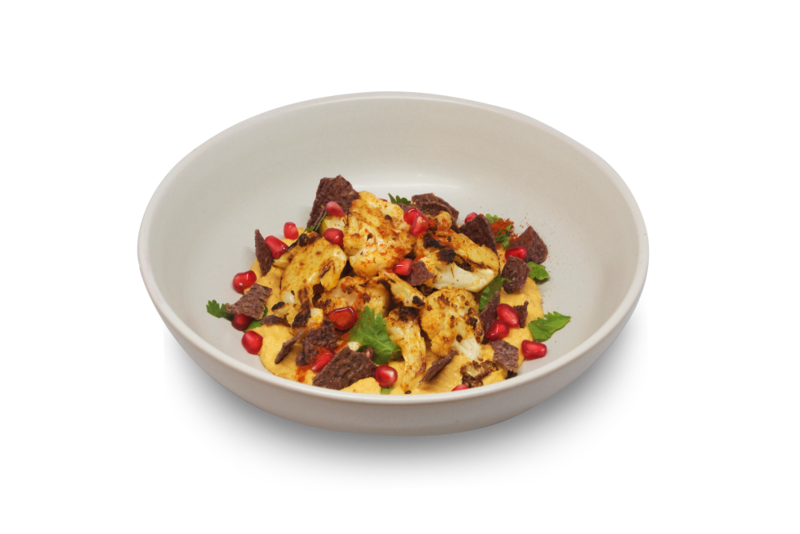 Step 8 Plate up by adding a couple of spoons of hummus in to a bowl, add a good helping of cauliflower and top with cut up coriander, slightly crushed corn chips and a couple of pomegranate seeds.